Turkish President Recep Tayyip Erdoğan held a rally in Sarajevo on 20 May ahead of the upcoming Turkish elections scheduled for 24 June. Vuk Vuksanovic draws three lessons from the rally: that Turkey is in the process of adopting a more assertive approach to foreign policy in the Balkans; that Erdoğan is intent on using foreign policy in the Balkans to achieve his domestic political goals; and that Erdoğan has a firmly embedded desire to openly challenge the EU. On 20 May, Turkish President Recep Tayyip Erdoğan held a large political rally in Sarajevo, the capital of Bosnia and Herzegovina. The rally was part of Erdoğan’s election campaign for the Turkish parliamentary and presidential elections. The rally attracted a large number of people as 10,000 supporters of Erdoğan and his Justice and Development Party (AKP) were brought in from across Western Europe. The rally also gathered an equal number of native Bosnian Muslims: Olympic Hall, where the rally was held, has 20,000 seats. The rally provided three relevant lessons for understanding Turkey’s role in the region and Erdoğan’s approach ahead of the elections. First, it showed that Turkey is intent on confirming a more assertive approach to foreign policy in the Balkans. Second, it highlighted that Erdoğan is ready to use the country’s foreign policy, including in the Balkans, for his domestic political ends. Third, the rally underlined Erdoğan’s proclivity for openly challenging the EU. The first lesson speaks of the Turkish ability to act as an independent regional player in the Balkans. Turkey has been acting this way for the last ten years as the financial crisis of 2008 and the neglect of the Balkans in Western strategic calculations has created a power vacuum that Turkey has been filling alongside other non-Western players. One might say that for Turkey the Balkans is the only place where its foreign policy has been successful, as opposed to the failures in the Middle East, and to being sidelined by Russia in the Caucasus and Central Asia. Strong relations with Muslims in Bosnia are among the central pillars of Turkey’s regional policy. Erdoğan once famously said that Alija Izetbegovic, the Muslim wartime president of Bosnia, “bequeathed” Bosnia to him on his deathbed, angering Bosnian Serbs and Bosnian Croats. Alija’s son Bakir, the chairman of the Bosnian Presidency, and his Party of Democratic Action (SDA), are also nurturing close ties with Erdoğan and the AKP. On Twitter, Bosnian political scientist Jasmin Mujanovic described this relationship as one of “authoritarianism & patrimonialism”. Erdoğan is strengthening this partnership through the Union of European Balkan Democrats (UEBD), a Balkan branch of the Union of European Turkish Democrats (UETD): a Turkey formed lobbying organisation that was behind the rally in Sarajevo. Beyond this exclusive foreign policy dimension, the rally clearly highlighted the second lesson, that Erdoğan is becoming more prepared to use foreign policy and relations with friendly capitals to further his domestic political goals. Erdoğan’s rally was part of his efforts to win reelection and the Turkish diaspora in Western Europe will play an important role in this endeavour. 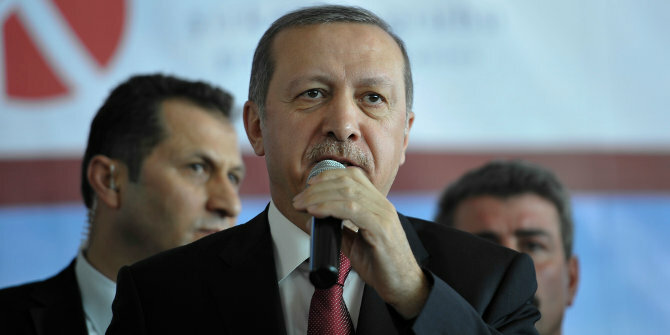 During the referendum held in Turkey on 16 April last year, Erdoğan’s proposal for constitutional change that mandated the expansion of presidential authority won by a narrow margin. Now it is evident that the votes of the Turkish diaspora in countries like Germany and the Netherlands played a major role in the outcome as 1.4 million Turks living in Western Europe participated in the vote. For the upcoming elections, 1.4 million Turks living in Germany alone will be eligible to vote out of a total number of 3 million Turks in Western Europe who will have the same rights. However, Erdoğan is finding it difficult to mobilise the support of his diaspora as EU countries with large Turkish populations like the Netherlands, Austria and Germany have banned him from organising political and electoral rallies on their soil. Therefore, the Turkey friendly city of Sarajevo, with its geographic proximity to the EU, was a perfect venue for organising a rally and thereby circumventing the EU states that had sought to prevent him from campaigning in Western Europe. This was also Erdoğan’s way of suppressing the influence of one of his most ardent domestic adversaries, the FETO movement, led by Erdoğan’s former ally and now arch enemy, Turkish cleric Fethullah Gullen, whom Erdoğan accuses of being behind the failed coup in 2016. Erdoğan is using his influence in the Balkans and Bosnia to combat the movement, which has developed its own network of followers in the Balkans over the years. Since the failed coup in Turkey, Ankara has been pressuring Sarajevo to close private schools funded by the movement in Bosnia. In neighbouring Serbia in October last year, Erdoğan visited Sandzak, the Muslim populated Serbian region, to send a message to Gullenists that he holds bigger sway in the area than them. In March 2018, Turkish intelligence officers also arrested six Turkish nationals in Kosovo linked to the movement, sparking a local scandal. By acting assertively in the Balkans, Erdoğan is combating one of his strongest domestic adversaries, an issue which is particularly important in Bosnia as Bosnian courts rejected the extradition of a Gullenist activist to Turkey in April, despite the close ties between the two countries. Finally, the key lesson from the Sarajevo rally is that Erdoğan has a firmly embedded desire to openly challenge the EU. Relations between the EU and Turkey have been experiencing difficult times, with the EU accusing Erdoğan of overseeing a decline in Turkish democracy, and Erdoğan accusing the EU of adopting a dubious stance towards the failed coup. With this in mind, and given the ban on rallies imposed by EU capitals, Erdoğan is prepared to throw down the gauntlet against the EU. The various options available to him have included pursuing a tactical partnership with Russia, threatening to influence migration flows, and ultimately acting more assertively in the Balkans, a region that is widely considered to be the EU’s backyard. Erdoğan has a more permissive environment to do so as the recent EU summit held in Sofia dashed any hopes of Bosnia, Macedonia, Albania and Kosovo being able to join the EU anytime soon. As these are all countries where Turkey has influence in one form or another, he feels more secure in making moves like the rally in Sarajevo. Turkey’s influence in Bosnia and the Balkans nevertheless has its limitations. The EU remains the primary economic partner for states in the region, trumping all other players. In the long term, the EU still holds a high level of attractiveness for the Balkan countries, including Bosnia. However, this does not mean that the EU and the West in general should take Turkey’s actions lightly. Erdoğan is trying to push forward his domestic illiberal agenda through the on-going election campaign and he is using the Balkans to do so. The challenge for the EU and the local actors opposed to Erdoğan is to devise a joint strategy of coping with the unpredictable regime in Ankara, but without provoking an unnecessary crisis and anti-Turkish hysteria. One thing is for certain, if the EU wants to exercise influence in the region, it must change its approach. + all of this with the aiding and abetting by the European militant hard-Left who seek to destabilize Europe, and for them to subsequently effectuate a hostile takeover of our governments and Judiciaries. Erdogan comes not as a friend, but as an Ottoman conqueror (or in the role as “spoiler” in the eyes of the militant hard-Left).